Darryl Wood and Theresa York, both residents of Farmington, demonstrate in front of the post office on Main Street against the Central Maine Power electricity corridor. FARMINGTON, Maine — In a 262-to-102 vote Monday night, Gov. Janet Mill’s hometown of Farmington rescinded an earlier letter of support for a $1 billion Central Maine Power electricity transmission project that would run through the town. 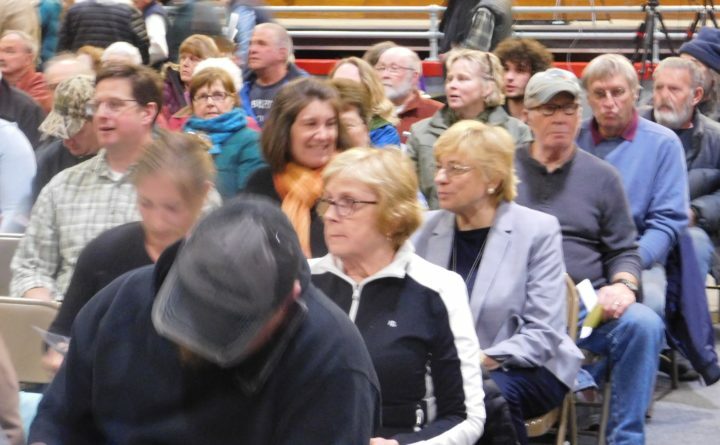 The 700-seat community center was almost packed for the town meeting vote, with the governor and CMP spokesman John Carroll both in attendance. Townspeople voted to rescind a July 25, 2017, letter in which the selectboard supported the project. In addition to rescinding the letter, they also chose to oppose the project rather than rescinding the letter but remaining neutral. The selectboard will issue a statement on behalf of the town to the Maine Public Utilities Commission, one of several regulators ruling on the project. The vote, using cards to protect individual privacy, was held after about 50 minutes of heated discussion. Voters placed colored slips either for or against the project into a box, where they were counted for the next 15 minutes. Mills appealed to townspeople about half an hour into the discussion to consider that hydropower is clean and generated in neighboring Canada, and that the new power would reduce the prices of electricity throughout the region, including Farmington. She also tried to allay fears that CMP would widen the corridor to the size of the New Jersey Turnpike, a claim made in opposition ads. “We’re not going to let them build the New Jersey Turnpike,” she said. “I believe on balance the transmission line is worth building,” she said. Mills added that the project will help wean Maine off fossil fuels. Farmington, with a population of about 7,500, is the largest town along the corridor so far to reverse its original support for the project. Last week, Franklin County’s commissioners rescinded support for the project. Despite Monday night’s vote, Carroll said he is confident there is a thorough process at the state level with review by the PUC, the Department of Environmental Protection and the Maine Land Use Planning Commission, all of which must endorse the project. 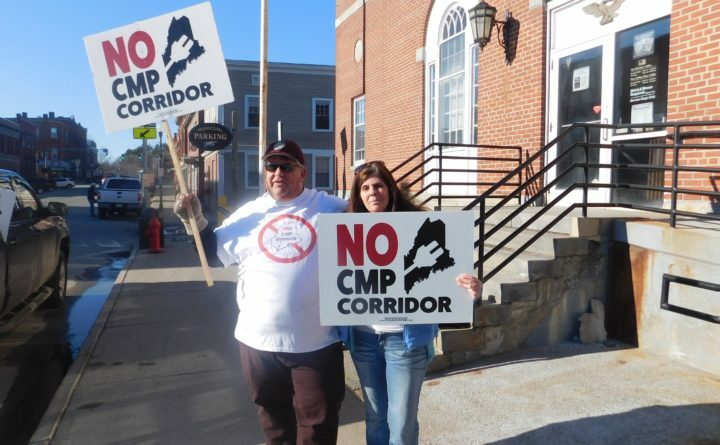 Darryl Wood and Theresa York, both Farmington residents, held signs saying “No CMP Corridor” in front of the post office on Main Street several hours before the meeting, which started at 7 p.m. Horns honked as cars drove by them, the result, Wood said, of some social media posts he made to garner support as the two stood in the cold afternoon waving their signs. The corridor, which runs from Beattie Township at the Canadian border to Lewiston, is about 145 miles long. About 73 percent of the transmission line will be built within CMP’s existing transmission corridor, according to CMP permit applications filed with the Maine Department of Environmental Protection on Sept. 27, 2017, to construct the transmission line. The new part of the proposed line would be built in an undeveloped corridor owned by CMP through working forestland in western Somerset and Franklin counties. The DEP created a detailed map on the project on its website. York said her main concerns are the clean energy claims and the way CMP informed Mainers about the corridor. But she remains skeptical, especially in light of Mills’ recent support for the project that she had been skeptical about during the 2018 gubernatorial campaign. On Feb. 21, the governor’s office, along with a wide-ranging group of nine other supporters including some environmentalists, filed an agreement with regulators on an enhanced package of benefits for the project worth hundreds of millions of dollars to Mainers. “Mills is from this town,” York said. “People will look at this in the long run. I think it may hamper her re-election. The $1 billion project, called the New England Clean Energy Connect, or NECEC, would deliver electricity through western Maine for use by Massachusetts to meet that state’s clean energy goals. Massachusetts had initially selected a project in New Hampshire to supply the clean power, but when that fell through, the CMP project came to the forefront in March 2018. CMP’s Carroll said that initially, 37 ot the 38 towns that the corridor runs through had written letters of support for the project. New Sharon, which hadn’t set up a meeting on the project, was the only exception. The letters came from boards of selectmen, councilors or commissioners. Since then, he said Caratunk, The Forks, West Forks and Wilton have expressed opposition to the project. Other towns, including Jackman, Moose River, Dennistown and Embden, rescinded support. Caratunk, a town of 68 residents, in September 2018 became one of the first to retract its earlier letter of support for the project, calling it harmful and saying it is not financially beneficial to Maine’s economy or its residents. In an Aug. 31 public comment letter to the Maine Public Utilities Commission, Elizabeth Caruso, chair of Caratunk’s selectboard, asked the PUC, the DEP, the LUPC and the Massachusetts Department of Public Utilities not to allow the NECEC project to go forward. In August 2018 a group of Franklin County representatives requested a package of economic development, other benefits and cash worth about $26 million from CMP to share in some of the income and benefits the utility would gain from the proposed hydropower project, but the meeting was postponed and did not take place. At that time, CMP already had offered $50 million to help low-income electric customers in Massachusetts as part of the deal. It also has offered a deal worth up to $22 million to mitigate the scenic impact of the transmission line to a group of stakeholders in the Kennebec Valley Gorge. After opposition to the project increased, the Feb. 21 letter this year supported a proposal in which CMP and Hydro-Quebec offered hundreds of millions of dollars in benefits to Mainers.